Emily Forsyth worked for Amy Air for most of her life, she had the beautiful apartment, flash car, enough designer items to open her own shop and a pilot boyfriend, Nigel, who she loved dearly. When Nigel announces that he’s leaving, Emily takes the news badly. After some pet talking from her friends she realises that it’s the perfect time to follow her heart and have a go at being an actress, a job she has always wanted to do, before it’s too late, or is 40 too late already? There has to be some sacrifices, though to becoming an actress including living in someones backroom instead of the swanky apartment, riding a bike not a flashy car and doing lots of low paid jobs just to bring some money in. Was Emily right to quit her job and follow her heart? Time will tell. 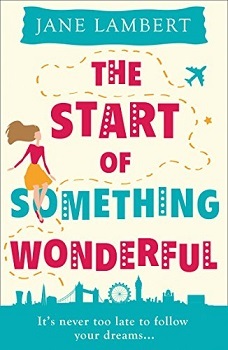 The Start of Something Wonderful is pure chick-lit and a real joy to read. Emily is a lovely character, far stronger than she thinks she is. I mean, how many of us would have the bottle to change careers at 40? Especially if it meant giving up a life of luxury and stepping into the unknown – not many I would guess. From the opening chapter to the final page I was captivated by this book. It has that ‘just one more chapter’ pull, although my only crumble is that the chapters are really long, so that one more chapter could see me sat for another 20 minutes reading, although, that’s not something to really complain about! The plot is filled with lots of amusing scenes, weaved within uplifting, thought-provoking, heartwarming scenes. If you take anything away from this book, it is that it is never too late to follow your dream. You can tell from the writing that Ms. Lambert has first hand experience of Emily’s situation and if this book is anything to go by, as well as acting, she is also a brilliant novelist. I am looking forward to reading more from Ms. Lambert, and especially more about Emily. I saw this on NetGalley and thought it sounded interesting. I will need to sign in and request it now. That’s funny about the longer chapters. I’m like that too. I hate to stop reading in the middle of a chapter. Part of that is because I read on the Kindle app on my phone, my tablet, and my kindle. Sometimes they don’t all sync with each other. I like reading books with older MC’s. I love, love, love that cover. Awesome review! Doesn’t seem like a book I’d currently enjoy, but I like the idea that it can reach hurting hearts. This sounds really interesting. Will check out, just for your great review. This sounds like a great book and I love that the author was inspired by her own life experiences 🙂 Great review!